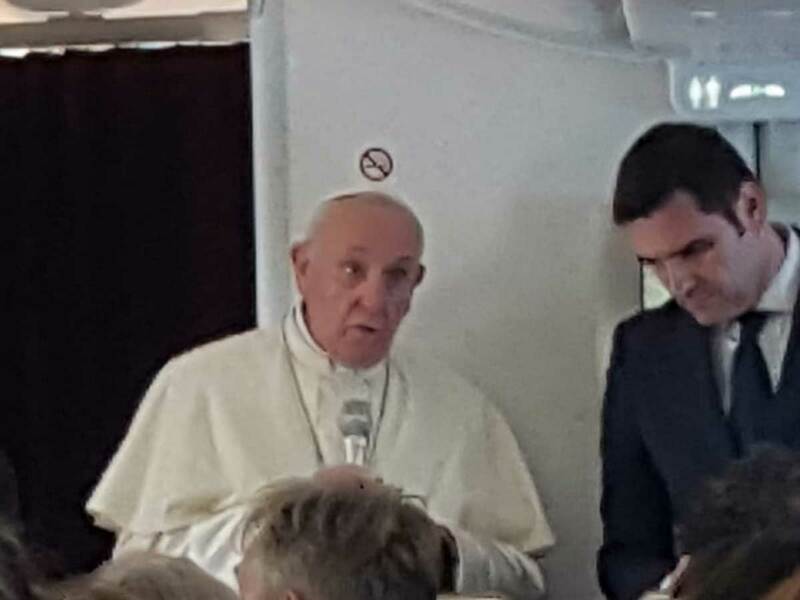 On the Papal flight returning to Rome. 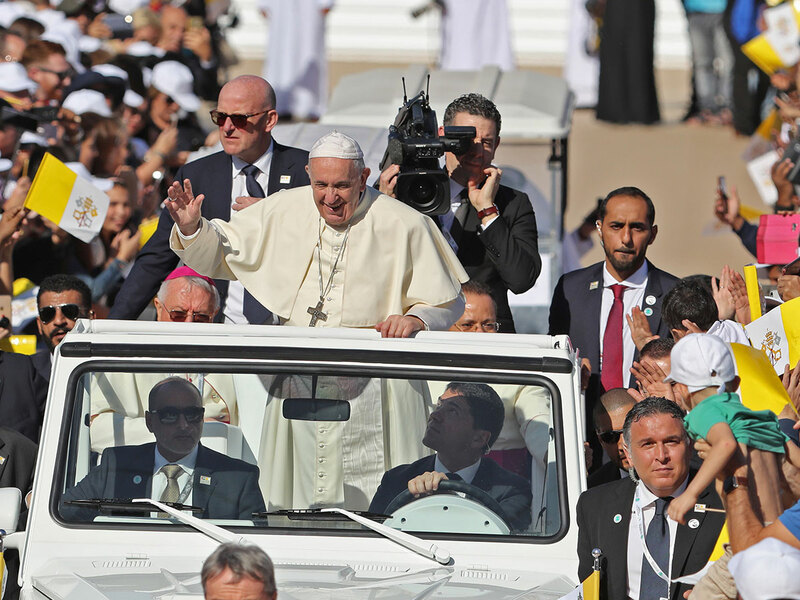 The Head of the Catholic Church His Holiness Pope Francis was seen off at the Presidential Flight by His Highness Shaikh Mohammad Bin Zayed Al Nahyan, Crown Prince of Abu Dhabi and Deputy Supreme Commander of the UAE Armed Forces, and a host of other UAE shaikhs, ministers and dignitaries. The Abu Dhabi Crown Prince went on to laud the launch of the 'Human Fraternity Declaration' signed by the Pope and His Eminence Dr. Ahmad Al Tayyeb, Grand Imam of Al Azhar Al Sharif, which seeks to build bridges of love, amity and coexistence among peoples. Shaikh Mohammad was presented with a copy of the Declaration from the Pope before his departure. 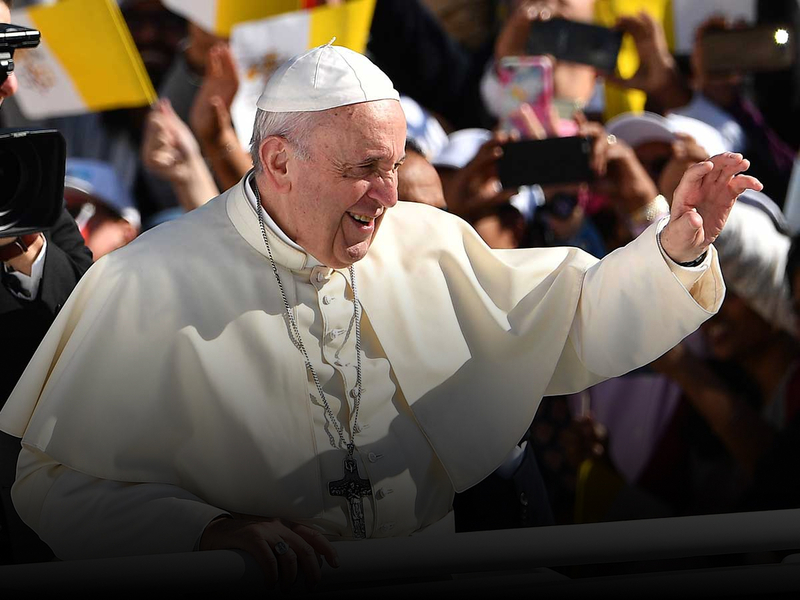 It is customary for the Pontiff to send telegrams to Heads of State of the countries over which the papal plane will be flying over as travels. 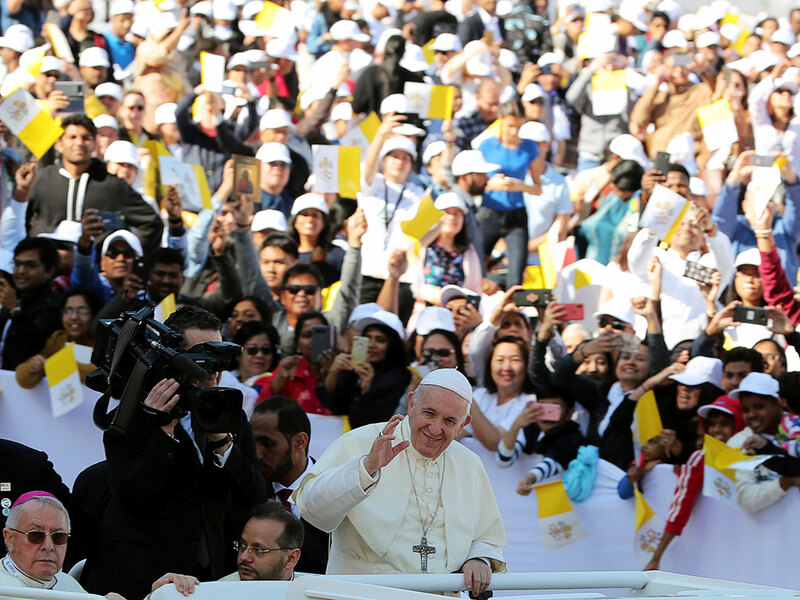 In a message to President His Highness Sheikh Khalifa bin Zayed Al Nahyan, Pope Francis said, "As I depart from the United Arab Emirates, I renew my deep appreciation to Your Highness, the government and the people of the UAE for your warm welcome and generous hospitality. I assure you of my prayers and invoke upon all of you abundant divine blessings," the message said. 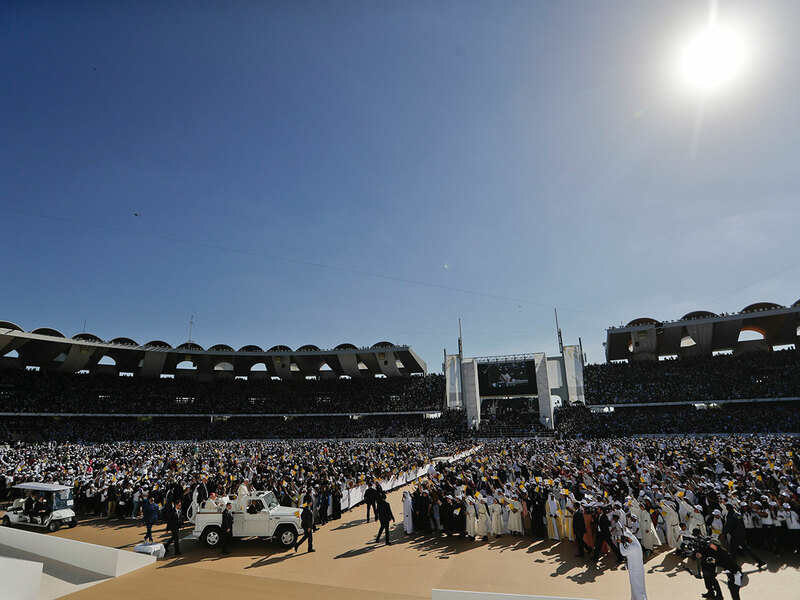 His Holiness Pope Francis, Head of the Catholic Church, today delivered a Holy Mass in front of 180,000 worshippers who gathered inside and outside of the Shaikh Zayed Stadium to participate in a historic moment for locals, residents and the visitors of Abu Dhabi. Delivering a greeting at the end of the Mass, Pope Francis said: "Before concluding this celebration, which has been a source of great joy to me, I wish to extend my affectionate greeting to all of you who have participated; the Chaldean, Coptic, Greek-Catholic, Greek-Melchite, Latin, Maronite, Syro-Catholic, Syro-Malabar and the Syro-Malankar faithful." 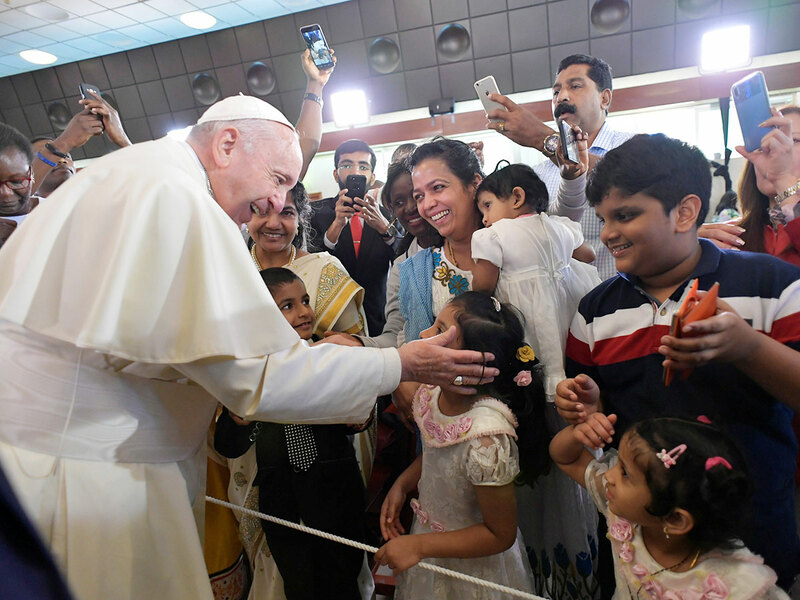 "I sincerely thank Bishop Hinder (Apostolic Vicar of Southern Arabia) for the preparations of this visit and for all his pastoral work. A warm thanks also to the Patriarchs, Major Archbishops and all the other Bishops present, to the priests, consecrated persons and to so many lay faithful who are deeply committed, with generosity and a spirit of service, to their communities and to the poorest." "May Our Most Blessed Mother Mary sustain you in your love of the Church and in your joyful witness to the Gospel. Please, do not forget to pray for me. 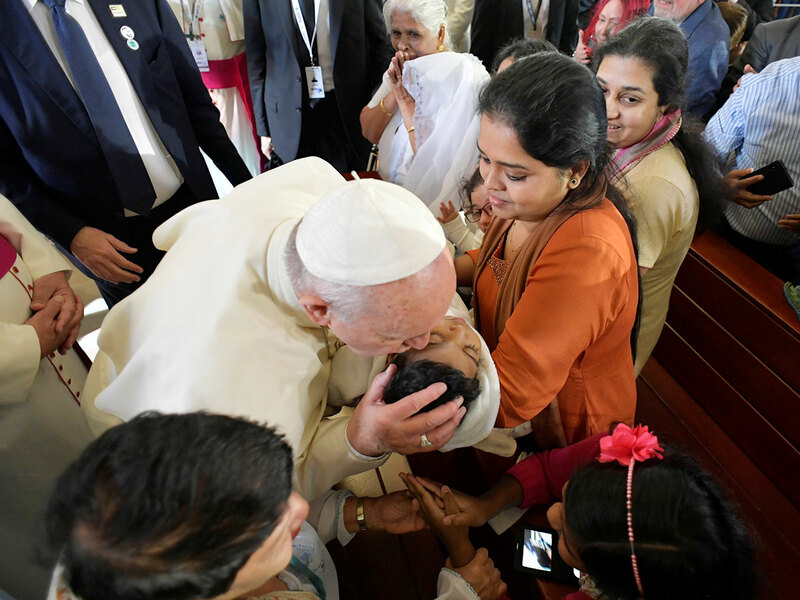 Thank you!," the Pontiff said in conclusion. “The Lord is close,” Pope Francis tells the congregation in his Homily in Italian. 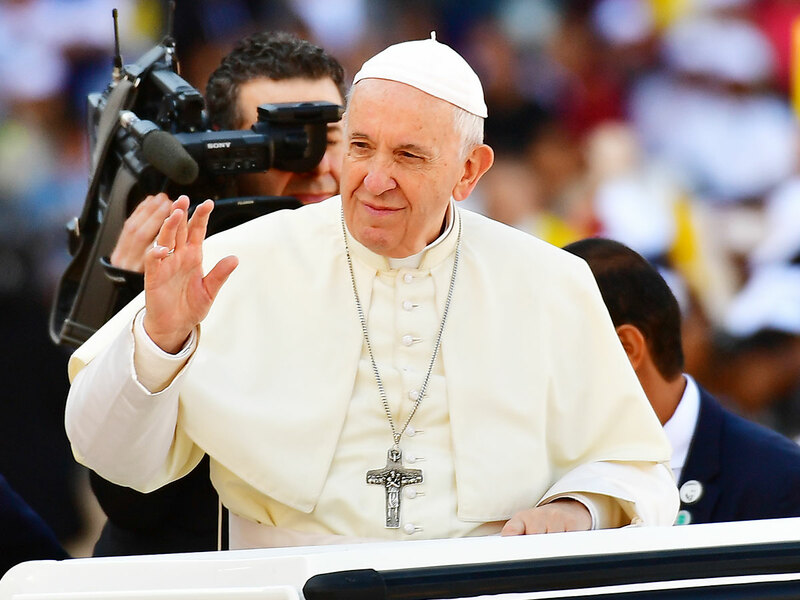 The Pope preaches about “gracias”, graces…and living out the Beatitudes. An Arabic translation of the Pope’s homily immediately follows. In front of me, a journalist is writing on his laptop in Malayalam script. To my left, a Spanish reporter does her spiel in her own language. A CNN team is not far behind. People everywhere can watch the mass live on YouTube. And passengers on board Etihad and Emirates flights have access to it, too. The cultures, tribes and tongues gathered here in Abu Dhabi, the technical arrangements that made all these possible, is just amazing. It’s the first time the Pope is saying mass in Arabia, and the first time a mass is beamed live to UAE airlines at 30,000+ feet. The message — “the Beatitudes are not for supermen, but for those who face up to the challenges and trails of each day” — is timeless. The way to get it — at home, in a stadium like where we are, on social media, in a passenger jet — is almost limitless. The message we listen to, or train our eyes on, is entirely up to us. As the Papal mass starts here at the Zayed Stadium in Abu Dhabi, I’m next to a group of Emirati men and women. The choir sings the entrance hymn. 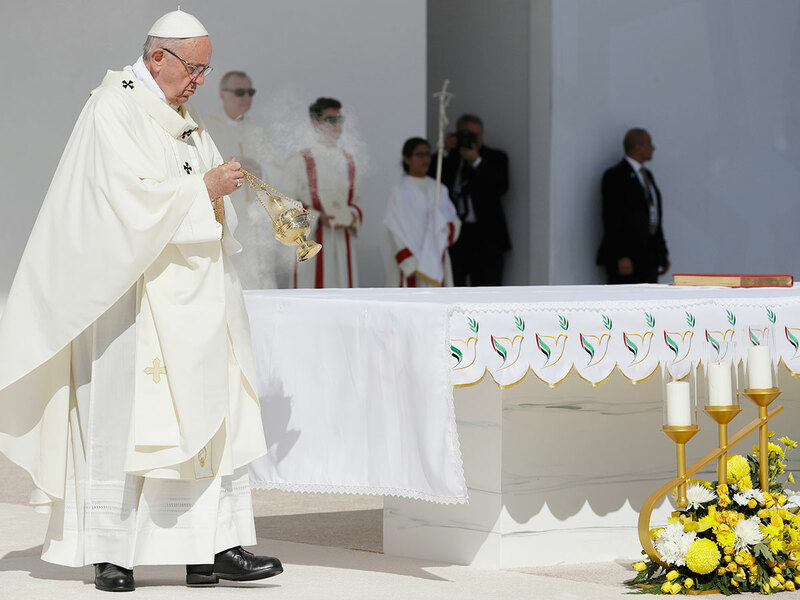 The Emiratis respectfully stood at attention, along with the congregation, gathered as the Pope and his ministers entered the all-white altar in the middle of the football pitch, to start the prayer service. Composed, observant, respectful they are, as the choir sings the entrance song: “Christ, Be Our Light.” Pope Francis asks those gathered to confess and acknowledge past sins. The sound system here is concert-quality. The choir sings with a majestic voice. First reading, Paul’s letter to the Philippians (4:6-9), is read in in Arabic. Now the Pope is giving his homily... Three choppers hover overhead. Gulf News staff Fermel Fuentes was chosen amongst hundreds of singers who auditioned for a solo for the Papal Mass. Fuentes said he did a music video, which served as an audition. The video was then sent to the Vatican for approval. And to his delight, the video was chosen. 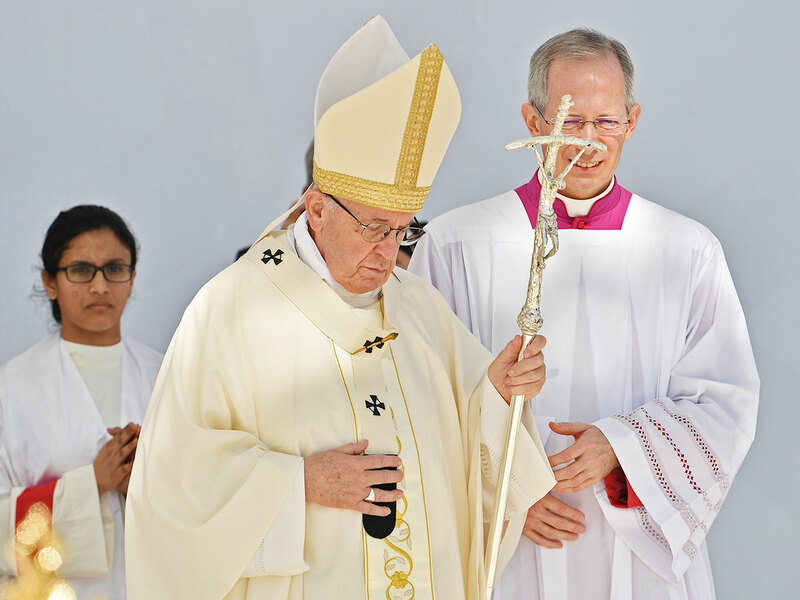 “I am very happy that I was a part of this momentous event in the UAE, let alone to sing solo for His Holiness Pope Francis during this historic visit to the UAE, Fuentes said. Fermel is one of the members of the Dubai Chamber Choir, founded in December 2004 in the UAE. It’s a beautiful, extraordinary day in the United Arab Emirates. 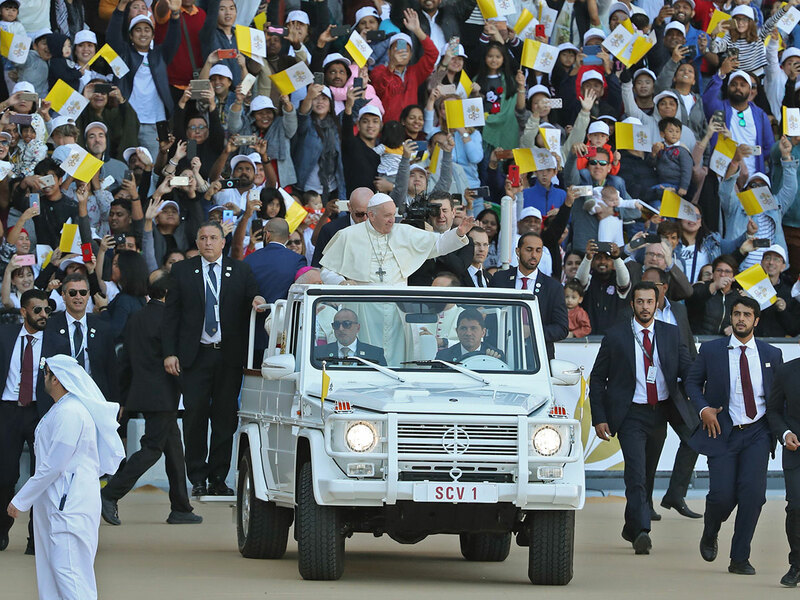 A sea of white-and-yellow flags, the Vatican colours, and chants of “Viva El Papa!”, welcome Pope Francis as he enters the stadium in a top-down white vehicle. Overhead, at least choppers are hovering. One must give it to Abu Dhabi — for leaving no stone unturned in making this visit possible. 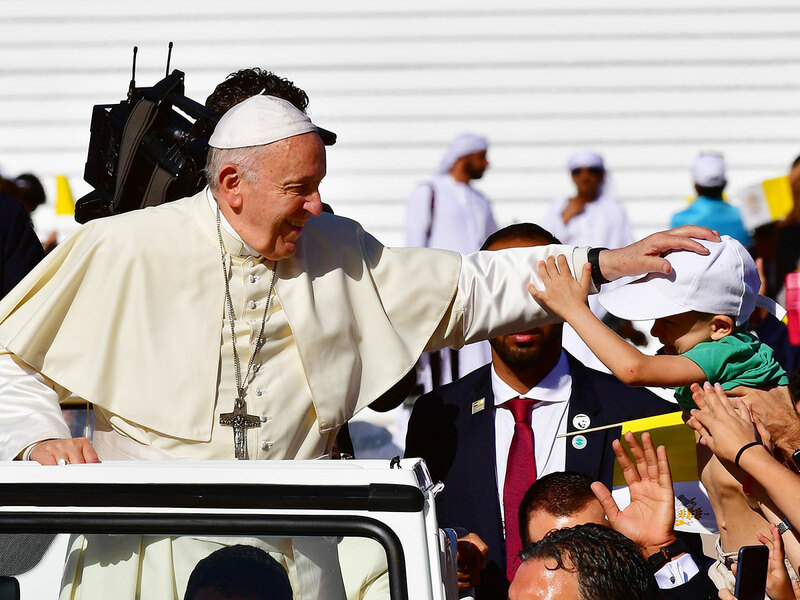 In the last three days, the United Arab Emirates’ reception and arrangements for the Pope can only be described in superlatives — grand, regal, elaborate. 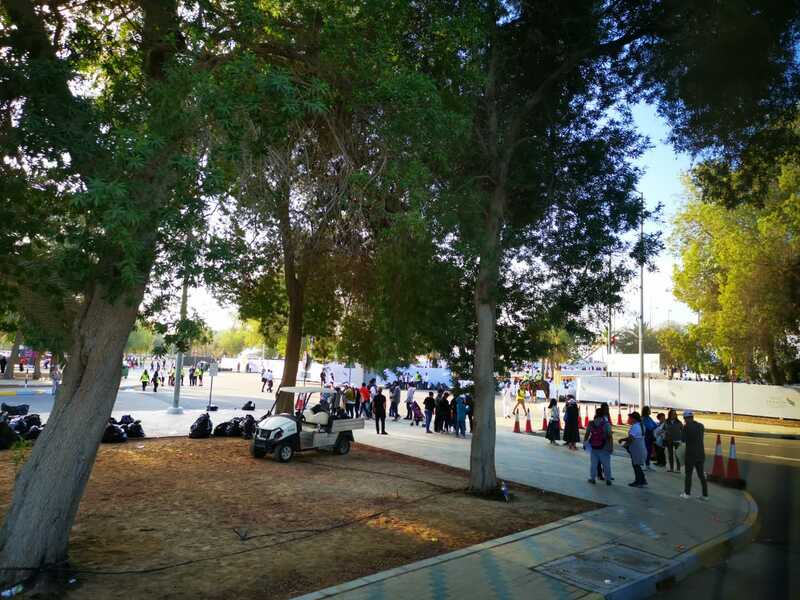 At the sprawling Zayed Stadium, security is tight but efficient. May those who come here be truly blessed with peace, joy and love. 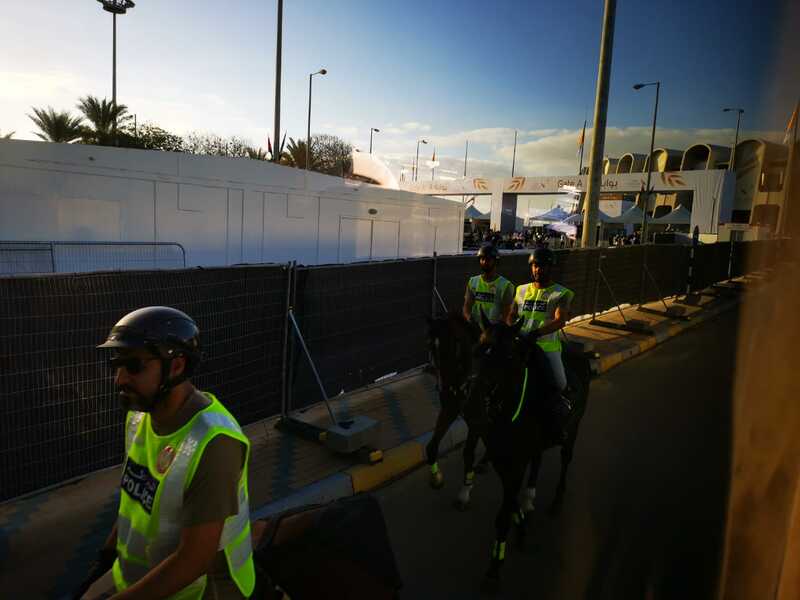 Including the police patrols on foot and astride horses, the exceptional people who provided the facilities — mobile toilets, at ambulance units, a lost-and-found corner, people manning the media centre — the volunteers giving free bottled water. The Pope mass is about to start. 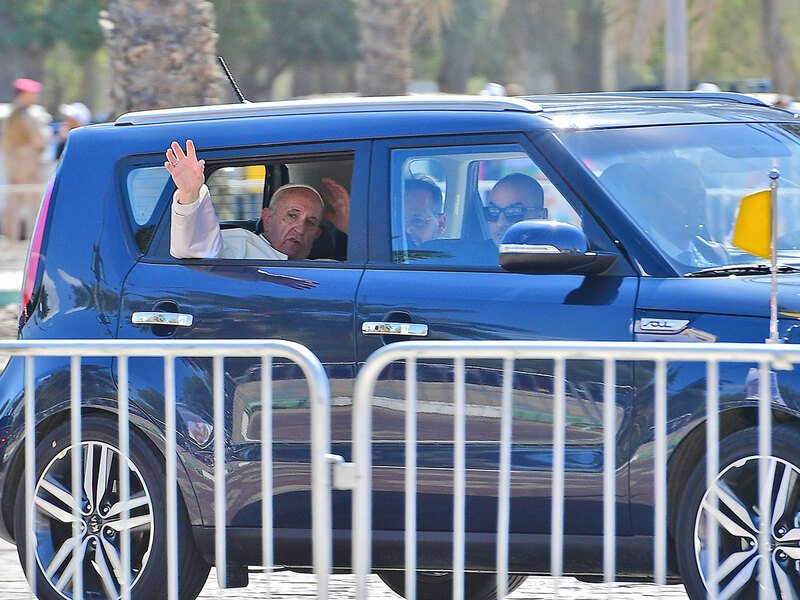 Pope Francis arrives at the stadium in a open-top Pope mobile as he waves and blesses thousands gathered. Minister of Tolerance Shaikh Nahayan Mabarak Al Nahayan has just arrived at Shaikh Zayed Sports City stadium to a loud applause. The pope arrived at St Joseph's Cathedral in Abu Dhbai and was greeted outside by a cheering youth choir wearing red-and-white robes. I’m here, in this stadium, because it’s my job. They’re here, this great multitude, because it’s their choice. To feed the soul, with this small act of sacrifice. To fill the heart, hungry for meaning and purpose. 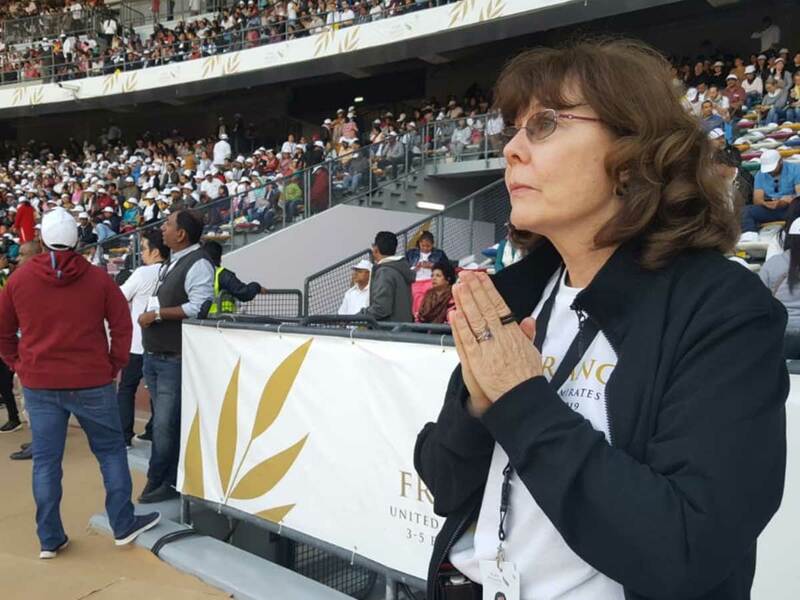 To be one, in an act of worship and prayer — with the head of the Catholic Faithful, Pope Francis, at the Zayed Sports City Stadium, now fast filling to the brim. A blessed morning indeed! 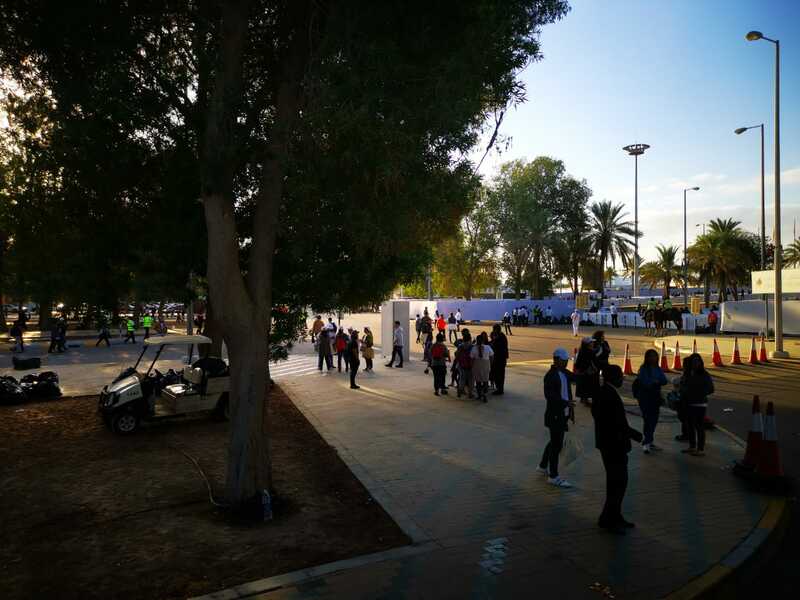 It is just 8am in Abu Dhabi and the Zayed Sports City Stadium is already reverberating with graceful singing of hymns, setting a spiritual countdown to the historic Papal Mass that is nearly two and half hours away. As the sound of music wafts in the air on a bright early morning, the stadium is quickly filling up with faithful - mothers holding infants, volunteers at hand to help the elderly and infirm, people of determination confidently making their way to their assigned seats to take a vantage point to participate in the Holy Mass for Justice and Peace presided by Pope Francis. 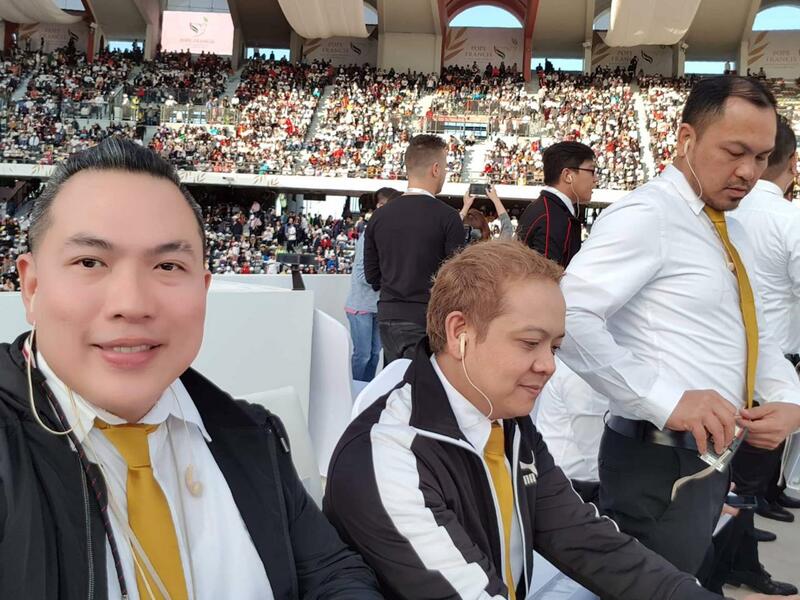 The international choir has taken its place at the stadium and started music rehearsals more than two hours ahead of the mass. 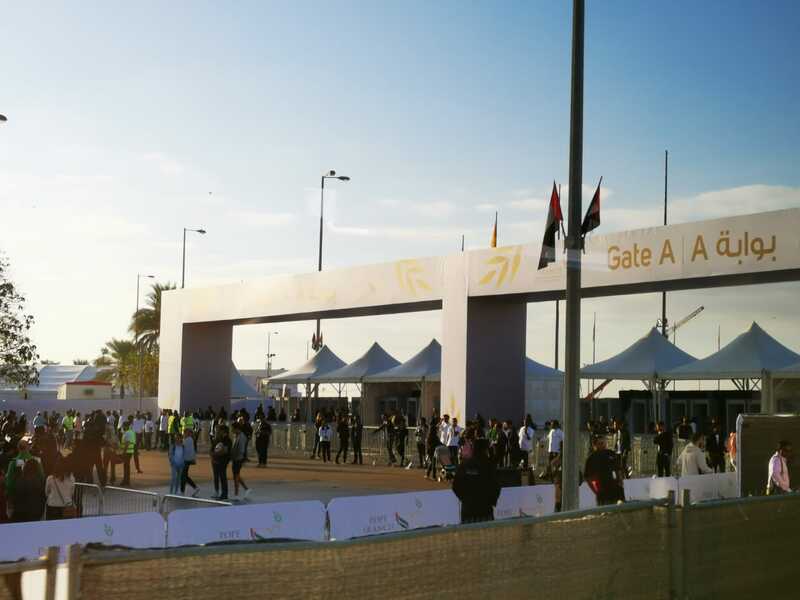 Thousands of faithful began to descend on the Zayed Sports City Stadium as early as 2am. 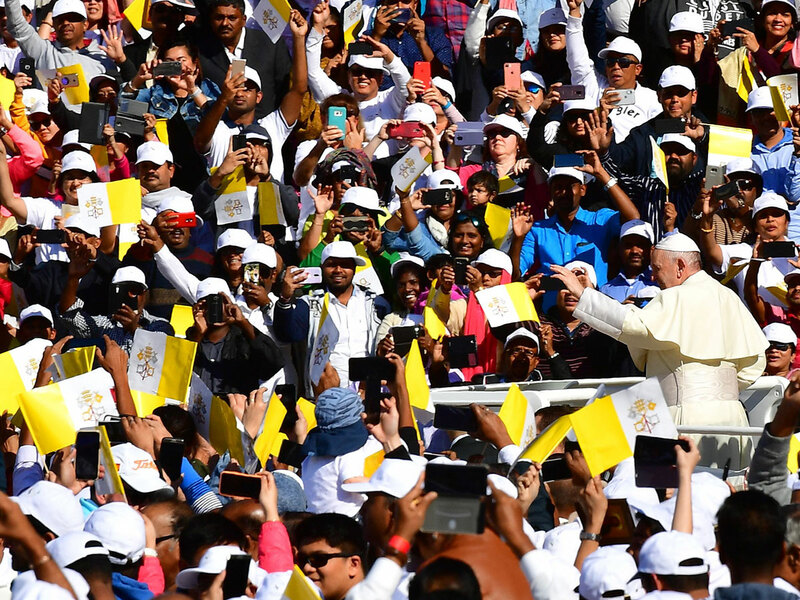 The winter cold did nothing to weaken the fired up spirits of the faithful. 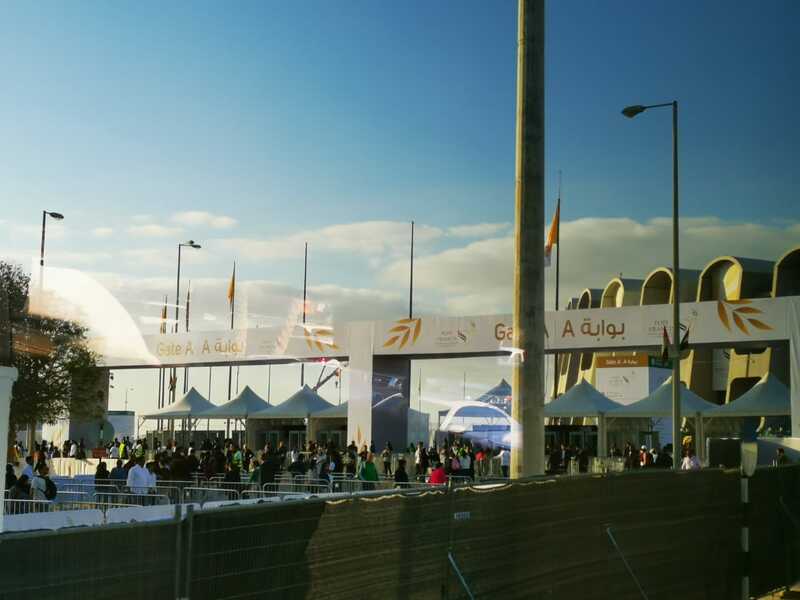 One by one, they entered the stadium in an orderly manner, many beaming as volunteers greeted them good morning. Free breakfast was distributed to the attendees with juice, banana, and water. Families took selfies as they entered the stadium, moms urging their kids for a jumpshot. Many were seen sleeping in their seats. Others were bundled up in the corner under the gallery seats. 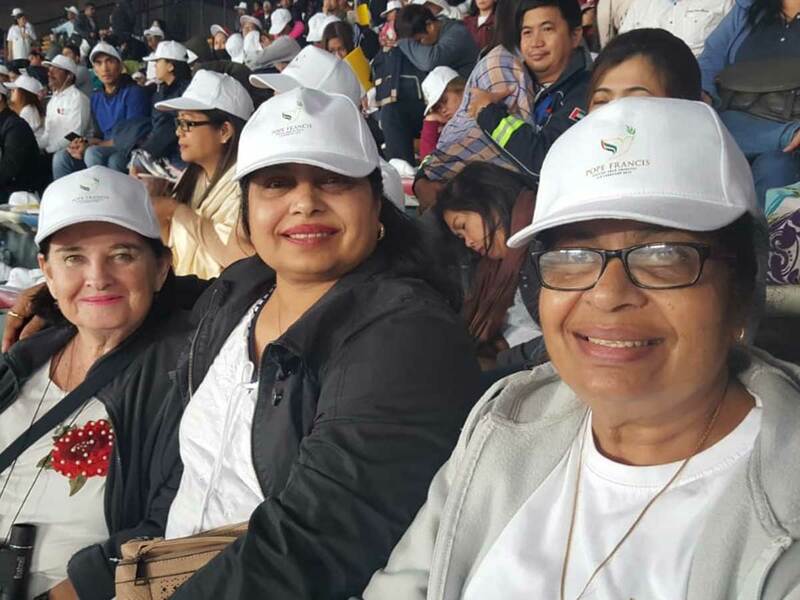 Friends Marie Claire Curley from Scotland, Lina Albuquerque and Philomena D'souza, arrived at the stadium at 4am. They left Dubai at 1.30am. The trio in their 60s walked nearly 3km from the bus drop-off point. "It was a good morning walk," D'souza told Gulf News. "Everybody is so pleasant and smiling." "The event is highly organised. Police were there to guide us on the way," Curley said. Some 1,400 volunteers have been at the stadium since 9pm Monday, among them is Mohammad Azeem. Azeem lauded the attendees for their cooperation. He hasn't had sleep like most of the volunteers. Their 21-hour duty is expected to end at 5pm.